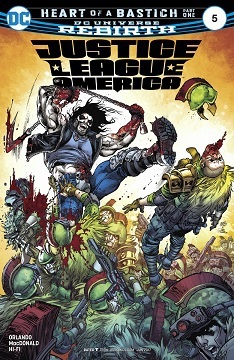 I see The Justice Leagues standards dropped with adding Lobo. are we really supposed to sympathize with the public in this issue? The mine closed, what were they supposed to do, train for new jobs? Move to where there were jobs? Something other than become arms manufacturers? Having worked with a couple of people in extreme poverty and homelessness, getting stuff done that average people would consider inconsequential can get to be a very elaborate production. It's easy to say "find a job" or "get job training" the reality can be much more difficult depending on where you are. Harder than finding an arms dealer to take over the town and enslave you? Pretty sure HE found THEM. People in dire and immediate need are sadly far easier to exploit. In a different political climate is probably accept this and move on, but in the current one I have to wonder how much help they turned down because of mistrust of the government, and how many other equally desperate people didn't get know this plan would hurt, not by accident but by design, when they chose it, and how much of their rage now is just because they're being targeted by behavior that they sought to encourage elsewhere. It only aids the con man to assume all his marks deserve to be fooled. 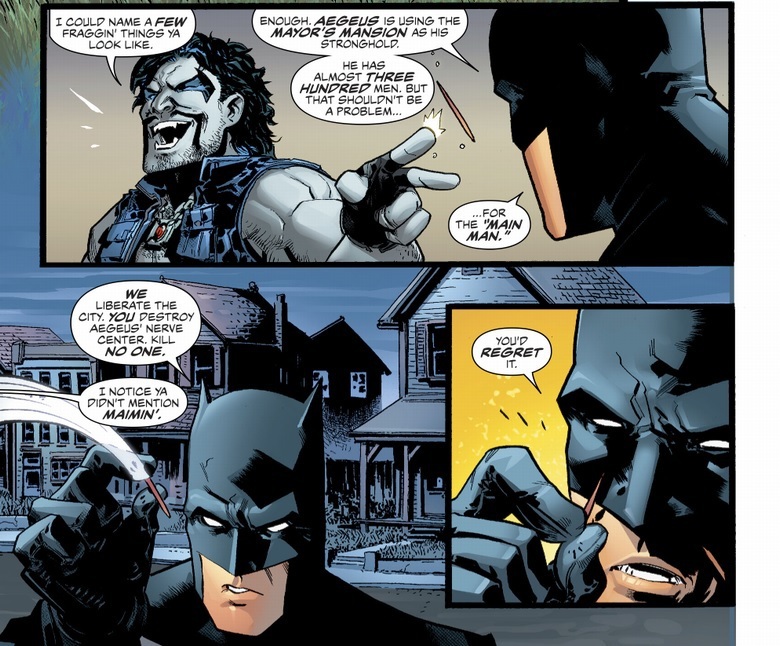 I like how Batman catches and inspects Lobo's toothpick as he says "You'd regret it". Prep time has begun for Lobo (if it hasn't already). This book needs something. Maybe they should bring back Vibe! I think it's okay, thought maybe Reis' could be a bit more constant. That said, the adventures are cool. That's not Reis, it's McDonald. Though with her origin in flux, who even knows what the Olympian pantheon is like nowadays? Does Billy Batson still have five of them living in his head though? They're not here, though. 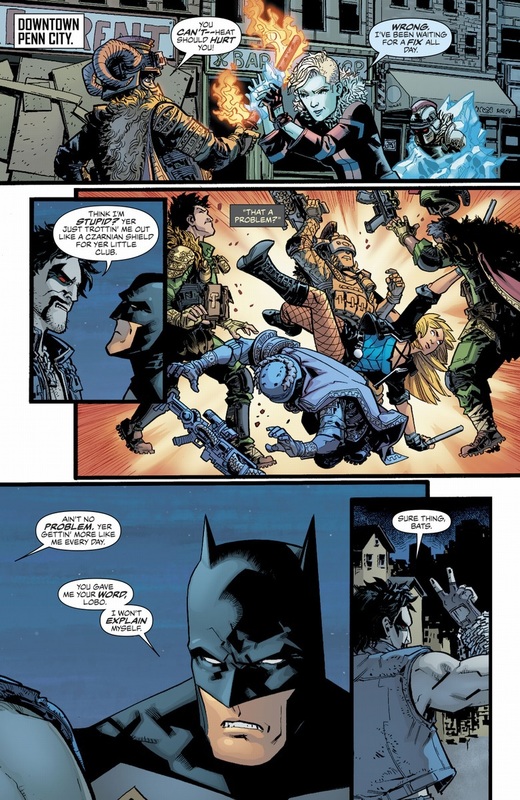 Batman's PR offensive calls for "relatable" heroes who aren't on a first-name basis with gods, leading to problems like exactly this. 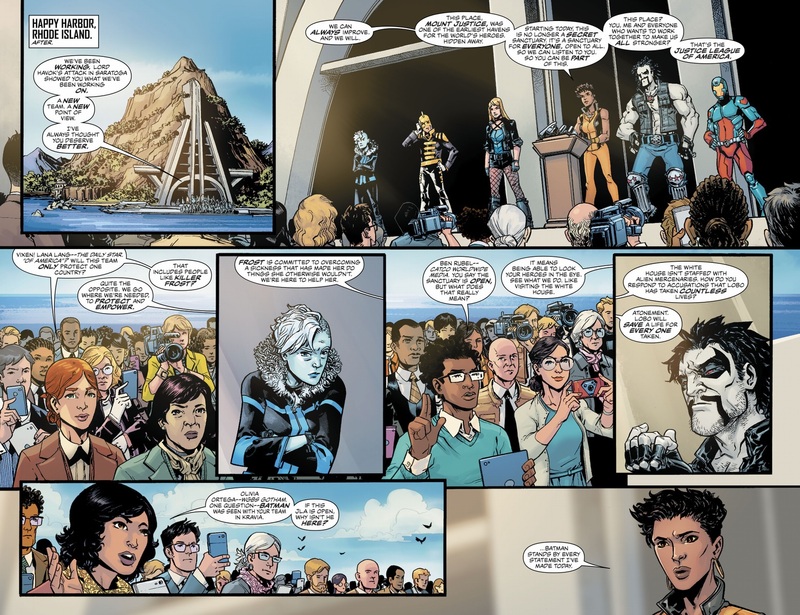 So... what's Lobo's deal? "One life saved for every one taken," sure, but since when is that something he cares about? And has he still killed multiple planets for fun in this continuity? 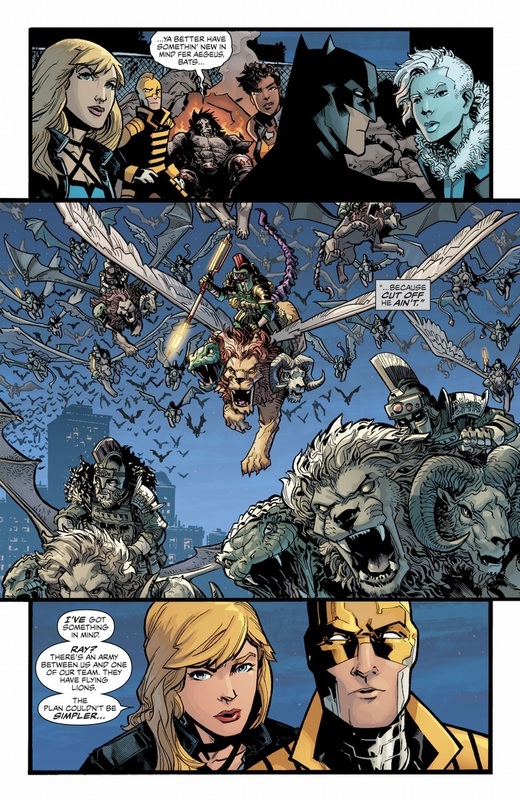 I don't think Earth even contains enough people to let Lobo save one life for every one he's taken. 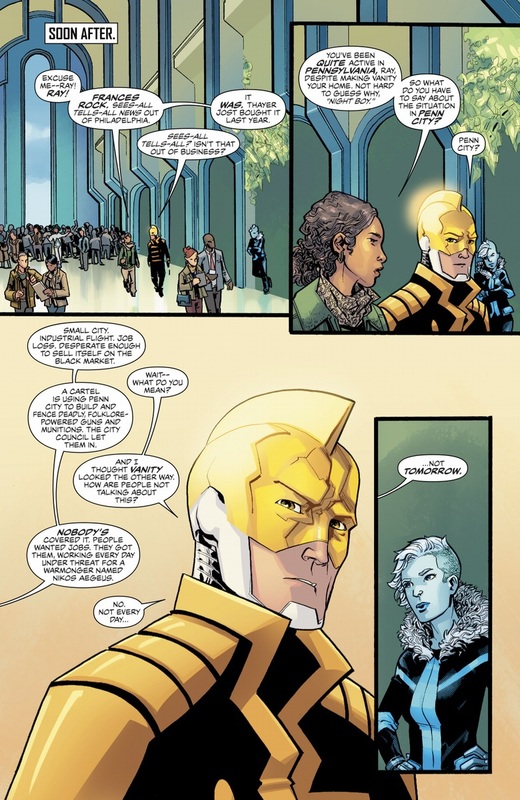 Sending him out to fight hundreds of people without maiming them sounds like a terrible idea, also. 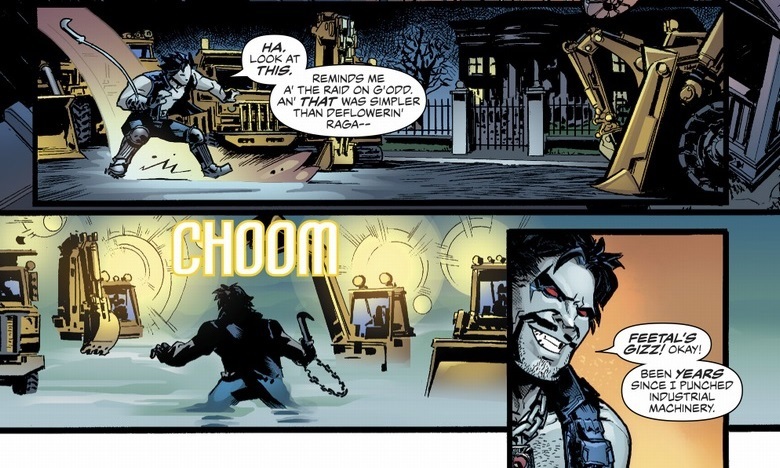 Lobo's never been very good at the whole "avoiding collateral damage" thing, even when he actually tried. 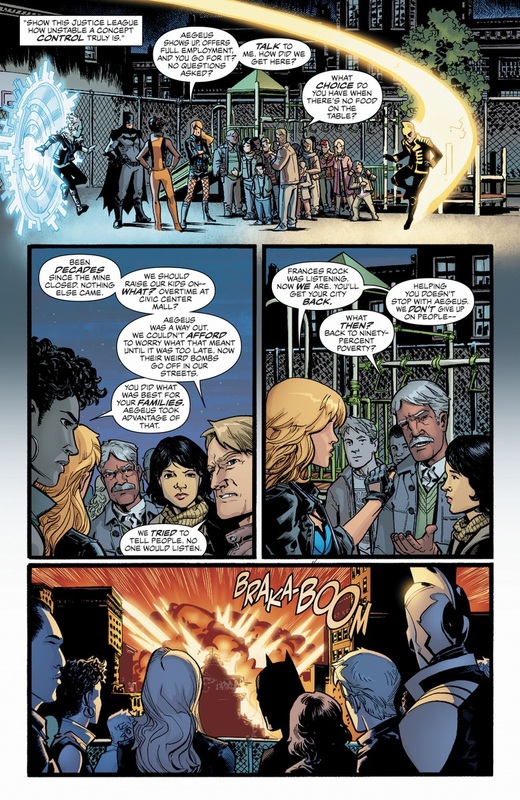 Someone remembered how Killer Frost's powers work! Wow! Lane Lang from "Superwoman" and Ben from "Supergirl"! Nice continuity. 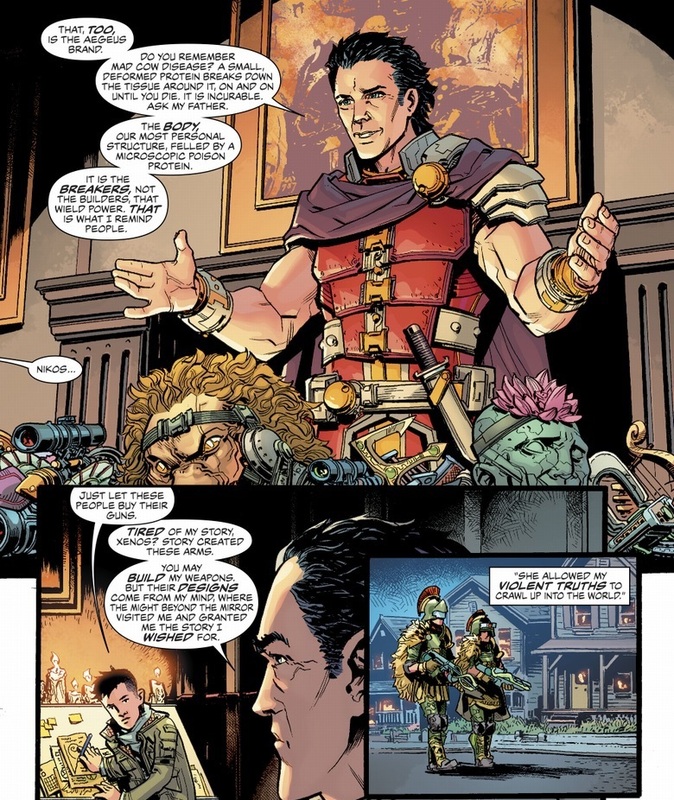 I love how deft a retooling Aegeus there is from his original Wonder Woman villain self- still a willful bearer of mythological weaponry, but dealing instead of slinging.